This morning it dawned cloudy, and after a good breakfast we started out for Holywell. The road is well known to me, and it being a trifle wearisome, I would be glad when it was over with. Once clear of Saltney we bounced along in high spirits via Hawarden to Northop. Climbing gradually, we got some fine views of the Dee Estuary as we neared Holywell. Beyond this town a formidable breeze sprang up, and the breeze, coupled with the road gradient gave us a warm time. Near St Asaph we met an Anfielder (Anfield CC) with whom we had lunch. 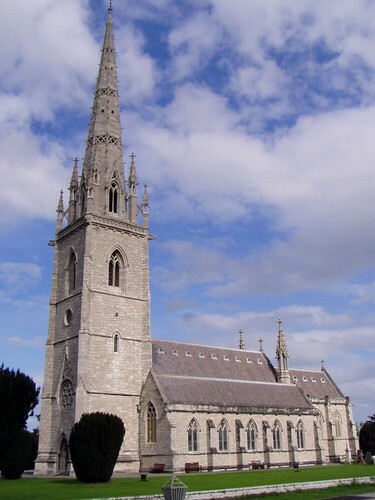 At 2.30pm, after visiting the famous Cathedral with its numerous memorial tablets, we crept along to Bodelwyddan, where, after taking leave of our Liverpool friend, we entered the famous marble church. It is a modern building but the structure and inside architecture are extremely beautiful, everything, even the walls are of marble. The font is unique and arouses some enthusiasm in its design. For miles, it seemed, we rode beside the now deserted famous Kinmel Camp until Abergele was reached on the motor infested highway to Conway. The surface was good and under the great walls of Gwrych Castle we made our way via Llanddulas to Colwyn Bay. It was raining here but it ceased before capes were necessary. Turning left at Rhos-on-Sea we soon reached the Conway River, and crossing over the famous suspension bridge we stopped near the Castle. One left us to visit some friends at Penmaenmawr, arranging to see us later, and the two of us remaining, storing our bikes, went to the Castle. We wandered about the massive ruins for an hour or so, visiting every nook and cranny. After tea we visited Plas Mawr, an ancient and well known building, famous for its secret hiding places and haunted room, the ‘Lantern Room’. The Royal Arts Exhibition was in progress and the whole building was filled with fine paintings. My friend went mad over them, and I had all my work cut out to drag him away. Afterwards we reviewed the smallest house in Great Britain. Leaving the town, we made towards the mountains by a steep winding road which eventually brought us to the head of the Sychnant Pass, a wild mountain pass. Down we swooped to the pretty village of Dwygyfylchy, where we met up with our friend and, after a long search found a suitable resting place. Afterwards I climbed Pen Sychnant, a stiff climb of 2,000ft, and after shouting ourselves hoarse beneath the echo rock we retired for the night.